Several nematodes belonging to the superfamily Filarioidea are responsible for filariasis. The adult worms are thread-like. Females are larger than males. The viviparous females give birth to larvae known as microfilariae. The microfilariae of various species can be easily differentiated from each other by the presence or absence of a sheath and the pattern of nuclear distribution in the tail. These nematodes require two hosts to complete their life-cycle. 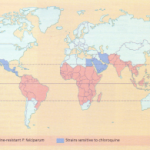 Bancroftian and Malayan (lymphatic) filariasis Wuchereria bancrofti is found mainly in the tropics and subtropics-in northern Australia, the Pacific Islands, West and Central Africa, South America and India. 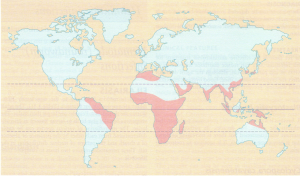 Brugia malayi infection is less widespread than Bancroftian filariasis and is found in India, southern China, Malaysia, Indonesia and Borneo. Humans are the definitive hosts and mosquitoes of various types are the intermediate hosts. Humans are the only known reservoirs of Bancroftian filariasis, whereas, in addition to humans, animals such as cats are reservoirs of Malayan filariasis. Culex fatigans, which bites at night, is the main vector of Bancroftian filariasis. Aedes and Anopheles spp. have also been implicated. The major vector for Malayan filariasis is Mansonia annulifera. Following the bite of an infected mosquito, the larvae penetrate the skin, enter the lymphatics and are carried to the regional lymph nodes. Here they grow and mature for up to 18 months. After fertilization the microfilariae produced are carried from the lymphatics into the blood; they do not produce any symptoms or signs. Adult worms produce lymphangitis, which is believed to be a hypersensitivity reaction. The lymphangitis is followed by fibrosis, a granulomatous reaction and later irreversible lymphatic blockade. Secondary bacterial infection may add considerably to the inflammatory response and resultant fibrosis. Habitat, vectors and major clinical manifestations of some nematodes of the superfamily Filarioidea. Following an incubation period that averages 10-12 months, the patient presents with fever ranging from 39 to 41°C accompanied by lymphangitis, both of whichusually subside in 3-5 days. Lymphangitis typically involves the lymphatics of the lower or upper limbs or of the abdomen. Involvement of the lymphatics of the epididymis, testis and spermatic cord occurs almost exclusively in Bancroftian filariasis. The involved superficial lymphatics appear as red streaks on the skin, and are tender and cord-like. The inflammation may subside either with treatment or spontaneously but there is a tendency for recurrences. The inflammatory phase is usually followed by the obstructive phase, which is characterized by features of lymphatic blockade. Many sites may be affected, but lower limb and scrotal oedema occur frequently. Long-standing obstruction produces thick, rough skin, which occasionally ulcerates. Less frequently chyluria, chylous ascites and pleural effusions occur. The obstructive phase may be punctuated by episodes of acute lymphangitis. The clinical presentation is characteristic. Eosinophilia and the presence of microfilariae in thin or thick peripheral blood smears is diagnostic. Since W. bancrofti and B. malayi are released into the peripheral circulation at night coinciding with the time of the mosquito bite, blood for examination should be taken between 9 p.m. and 1 a.m. If, despite repeated examination, microfilariae cannot be demonstrated in thick or thin blood smears, diethylcarbamazine 100 mg given as a single dose followed by blood removal 30 min later for examination may give a positive yield. Various parasite-concentration techniques such as Knott’s concentration or membrane filtration techniques have resulted in a higher positive yield. Serological tests are available but not highly specific. Diethylcarbamazine (DEe) 3-9 mg kg-I daily in three divided doses for 2-3 weeks is recommended. A second course after 6 weeks increases the cure rate. The WHO Expert Committee has recommended that a total of 72 mg kg-I be given for eradication of Bancroftian filariasis and 30-40 mg kg-I for Malayan filariasis. DEe is filaricidal. Following initiation of therapy, marked allergic reactions can occur and require concomitant administration of antihistamines or steroids. Associated bacterial infections should be appropriately treated. Reconstructive surgery plays an important role in removing unsightly tissue. Mass chemotherapy with DEe (often added to table salt) has been effective in decreasing the microfilariae rate (the ~centage of individuals who have micro filariae in a unit lume of their blood in a given population) and the icrofilariae density (the number of micro filariae per unit lume of blood in individual patients). Primary prophylaxis should be aimed at vector control and protection – humans from mosquitoes, particularly at night with regnated nets and repellant creams and sprays. Tropical eosinophilia has been attributed to micro filariae as Dirofilaria and more recently to W. bancrofti and -B.malayi. Two forms are recognized, one characterized mphadenopathy and splenomegaly, and the other by gh, bronchospasm and an asthma-like picture. id, swampy areas of West and Central Africa, in environment the deerfly vectors Chrysops silacea Chrysops dimidiata thrive. Following the bite of a female Chrysops, the microfilariae are introduced into the of the human host and tend to migrate in the subcueous tissues. They have a predilection for subconctival and periorbital tissues. The main feature of loiasis is Calabar swellings, which are painless, localized, transient, hot, soft-tissue swellings, “often near joints. They persist for periods varying from a hours to several weeks. They occur more commonly during the hotter months and may be preceded by numband tingling. They are produced by toxin released from the adult worm. Urticaria, pruritus, lymphoedema, arthritis and chorioretinitis may occur. The worm can be seen in subcutaneous tissues or crossing the conjunctivae. The characteristic micro filariae may be demonstrable in peripheral blood smears. Eosinophilia is present. Seroical tests such as the complement-fixation test are also useful. DEC 2-6 mg kg-l in gradually increasing dosage is effective against both adult worms and micro filariae although multiple courses may be necessary. Treatment should be continued for 2-3 weeks. Side-effects of treatment (caused by death of parasites) are fever, headache, urticaria and encephalitis; steroids may be necessary for these effects. Prevention is best effected by adequate personal protection. In addition, houses should be sprayed with dieldrin. Mass treatment of all the inhabitants of villages with DEC 2 mg kg-l daily for 3 days has reduced the incidence of this disease.